Nowadays, Bluetooth in your car is becoming as common as an AM/FM radio was 20 years ago. It’s a great feature that helps to eliminate potential distractions by allowing you to speak on your cell phone hands-free. There is also the added benefit of being able to stream your favorite music through the Bluetooth system. Of course, this only applies to vehicles that have been manufactured within the last 4-5 years. If you have an older vehicle, many times you are out of luck. This is an area where CoolStream sees an opportunity to bring in-car Bluetooth technology to the masses with the CarChat+. The design of the CarChat+ is pretty simple. It features a car power adapter with two 2.5A USB charging ports and a 3.5mm headphone jack to connect with your vehicle’s auxiliary port. There are 3 buttons on the device. A call button to answer incoming calls and pause your music, and a plus and a minus button to navigate your music. There is also an LED indicator light to let you know when the device is connected to power and to your phone via Bluetooth. One opportunity that I think they missed here was to integrate a voice launcher into the unit. My LG Tones can initiate the Google Now voice commands and it is the one thing that I would change about this device if I could. 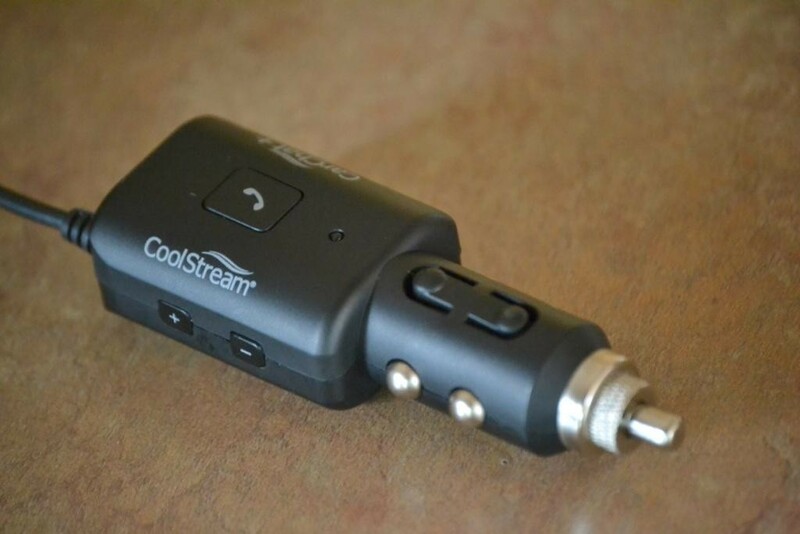 Like its sister device the CoolStream Duo, this device is almost plug and play. 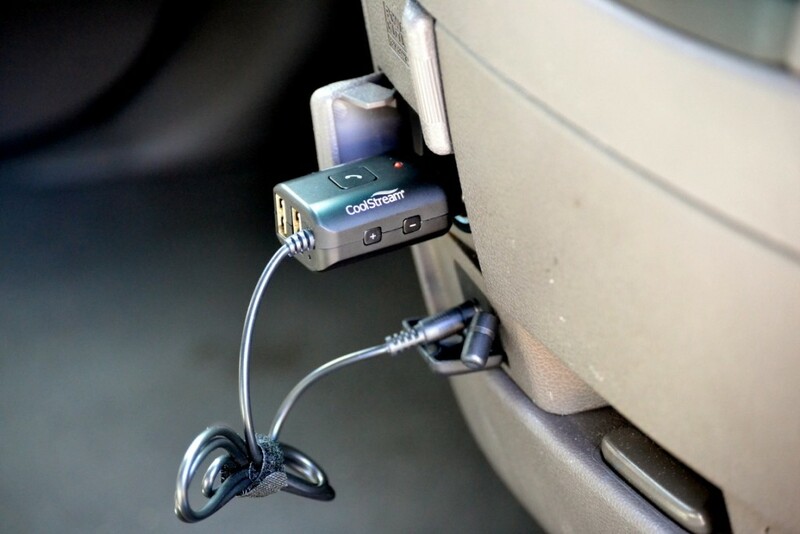 First, plug the Coolstream CarChat+ into vehicle’s power outlet. 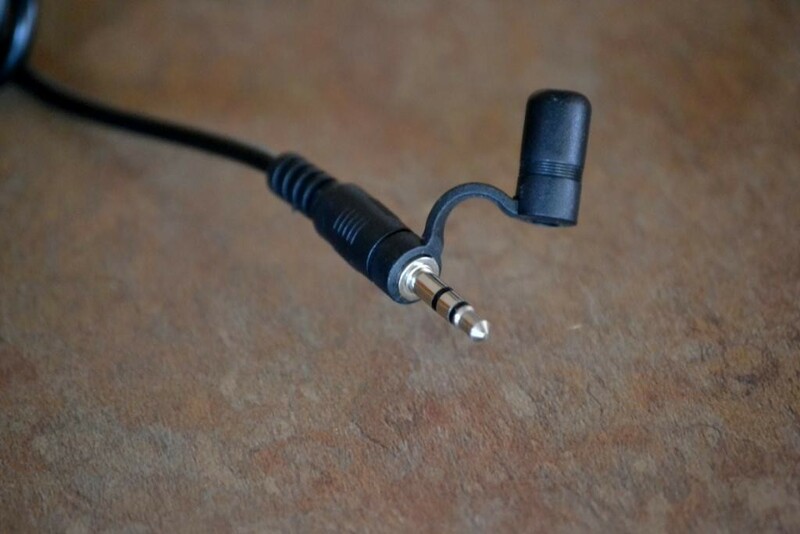 Second, plug the 3.5mm jack and plug it into you vehicle’s auxiliary port. You’re almost done. Of course, like every other Bluetooth device out there, you have to pair it to your phone. CoolStream makes it dead simple, by not requiring a pin number to complete the pairing process. Just search for devices on your phone and select CoolStream Car. Now you’re done. Dead Simple. I really like this device. I have another Bluetooth receiver that I was using before, but I had to manually turn it on, and it was battery operated. This allowed it to be more portable, but also less convenient. The CarChat+ feels like a factory installed Bluetooth system. It turns on and off with the car, and my phone connects to it automatically every time. Another great feature that I really like is that you can connect 2 devices simultaneously. When it comes to streaming music, this device delivers clear, distortion-free audio. There really wasn’t any buffering or pausing in the music either. When two devices are connected at the same time, the device that starts playing music first will be the one that you will hear. However, upon pausing the music on the first device, the second device can begin playback on the CarChat+. In terms of the voice function, let me say that the microphone works great. In my Honda Odyssey, the power outlet is placed low in the van. In fact, it was much lower the area that you would be speaking into naturally, but it didn’t seem to make a difference. Callers reported that they could hear me crystal clear. When two calls come in at once, the second device was the one that took priority on the call. The downside here was that if you were already on a call, that call would be interrupted and you would manually have to switch the call back to your handset. This could potentially be a big problem for the person driving. I recommend that the passenger turn off the phone audio in the settings to avoid this. This is a superb option for those without factory Bluetooth integration in their vehicle. If you have a spare outlet and an auxiliary audio port, then I highly recommend that you check this device out. The device retails for $29.99 with free shipping on their website and on Amazon. With such a low price, you really can’t go wrong here. 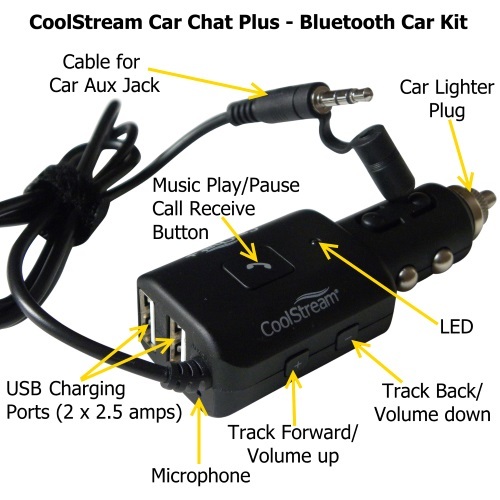 The post CoolStream CarChat+ a bargain Bluetooth device for your car review appeared first on AndroidGuys.